Is it halfway through the year already? Time flies when you're having fun . . . and we're having a lot of fun with all of the new releases and reprints for June. Check out the new titles, returning favorites, and Warehouse 23 specials, available now! Magic class like you've never seen it before. Pick up your Bubble Wand and hope you can find the Great Haul, or at least a Friendly Big Kid to help you out. Or maybe grab the Fire Drill or the Manual of Transmission, because here come the Ash Kicker, Huff & Puff, and the dreaded Moldy Mort! The art in Munchkin Spell Skool is adorable, but you've still got to slay the monsters, steal the treasure, and reach Level 10 to win! 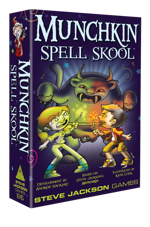 You can find Munchkin Spell Skool exclusively at Walgreens. 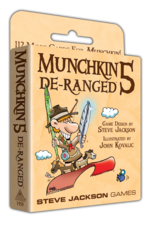 This is a stand-alone game, but it shuffles well into any other Munchkin game. Find your path . . . to backstabbing and gunslinging! Plus, there are plenty of new Monsters and Treasures in this 112-card supplement. 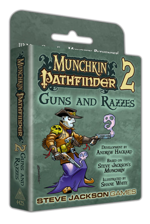 This is an expansion for Munchkin Pathfinder. It is not a stand-alone game. It's the ultimate book for the ultimate characters in the Fourth Edition of GURPS! 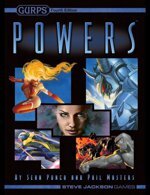 GURPS Powers has everything you need to create every kind of amazing, off-the-chart superhero you can imagine . . . as well as amazing wizards, wuxia fighters, shamans who command spirits . . . even gods! Written by GURPS Line Editor and Fourth Edition co-author Sean Punch, GURPS Powers introduces some new rules, but it is mostly about using the rules already in the GURPS Basic Set to cover super-powered characters, megawizards, and earth-shattering psionics. Powers also includes guidelines for "special effects" and several ways to vary a power on the fly – two crucial concepts for comic-book superheroics. This is a softcover reprint via CreateSpace's print-on-demand services. Inscrutable masters from hidden temples. Special Forces soldiers. Swashbuckling pirates. Bare-chested brawlers. GURPS Martial Arts brings fighting styles from throughout history to Fourth Edition. From popular Asian bare-handed techniques to European combat arts to fantastic non-human training, this book balances realistic historical schools with cinematic feats from Hong Kong, Tokyo, and Hollywood. Recreate the greatest fighters in the world, or create a style to fit a new campaign; Martial Arts has the techniques and guidelines you need. Not all combat options map to techniques and styles, however. 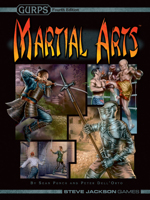 Many require extensions to the combat system itself, so Martial Arts expands on the combat and injury rules from GURPS Basic Set. Some of these additions are highly realistic, while others are extremely cinematic – but they're all optional, allowing the GM to decide which rules apply. Customizing the GURPS combat system has never been easier. Strong of arm and steely of eye, they lead the way and take the lumps. When it all falls apart, they cover the retreat. Some live for a cause; some die for it. They are warriors. The warrior is the backbone of every adventure group. GURPS Warriors gives you 29 fighter templates, letting you quickly create the warrior that's right for you. No two need be the same. Templates include soldiers from all time periods -- past, present, and future -- such as the aviator, cavalryman, commando, heavy foot soldier, marine, and rifleman. Warriors from the pages of history and literature, including the barbarian, berserker, gunslinger, holy warrior, martial artist, and swordsman. Specialists like the archer, engineer, guard, guerrilla, sharpshooter, and scout. High-tech fighters like the artillerist, aviator, mecha pilot, and naval crewman. Each template comes with four complete characters, drawn from a wide range of settings. All told, you get 116 ready-to-use sample characters, as well as historical background and information on the technology and tactics that shaped their professions. 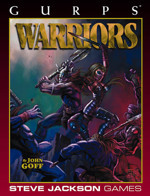 This version of GURPS Warriors also comes bundled with the 24-page GURPS Update, providing information on how to upgrade these GURPS Third Edition templates and characters to Fourth Edition! It takes a thief . . . When brute force won't get the job done, you need someone with . . . skills. A specialist. Preferably someone who doesn't let a lot of nagging concerns about law or morality get in the way. Whether you're looking for just the right character to round out an adventuring party, or a dangerous NPC to challenge your players, GURPS Rogues has what you need – 29 different templates, letting you quickly create the scoundrel that's right for the job. Templates include, thieves who are only in it for the money, such as the armed robber, cat burglar, pirate, pickpocket, housebreaker, and forger. 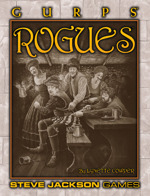 Rogues who have other goals than mere material gain, like the spy, hacker, evil mastermind, mad scientist, and saboteur. Charmers who work more with people's minds than with lockpicks and prybars . . . the con man, bard, fixer, gambler, prostitute, and street doctor. Mysterious figures who work on the shadowy edges of society . . . the tracker, poacher, assassin, master thief, smuggler, mobster, and black marketeer. Each template comes with four complete characters, drawn from a wide range of settings. All told, you get 116 ready-to-use sample characters, as well as historical background and information on the technology and tactics that shaped their professions. This version of GURPS Rogues also comes bundled with the 24-page GURPS Update, providing information on how to upgrade these GURPS Third Edition templates and characters to Fourth Edition! Another 112 cards for the best-selling game of killing monsters and taking their stuff. This is not a stand-alone game. 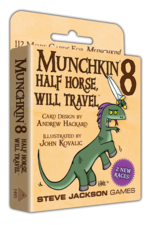 It is an expansion for Munchkin. 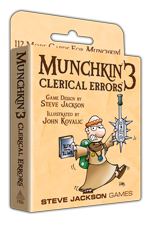 More of the twisted humor of Steve Jackson and John Kovalic in a 112-card supplement for Munchkin! A new Class! Rangers can tame monsters and ride them! Treasure! Track down the Philosopher's Scone, put Racing Stripes on your Steed, and fill your Canteen of Spleen with Carbonated Holy Water! Monsters! Beware the Telemarketer, the Poultrygeist, and the Undead Clowns. And imported monsters! That's right – this set includes unique monsters created by the European Munchkin publishers, available for the first time in English. Quake in fear at the Brothers Grimm and the Snerks! Or just kill them and take their stuff. Behold, a trove from the past! From 1980 through 1985, Steve Jackson Games published The Space Gamer, a general-purpose gaming magazine with features on roleplaying games, board and wargames, miniatures, game design, early computer games, and more. Nostalgia comes alive with articles, reviews, letters, and advertisements. 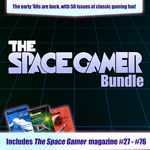 With this bundle, you'll get the complete collection of all 50 issues of Space Gamer from this era at a 50% discount! 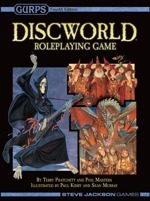 Journey through the off-kilter imagination of Sir Terry Pratchett in the Discworld Roleplaying Game, now in PDF form! There's a lot of unusual stuff on the Disc, but don't worry about getting lost – game author Phil Masters has crafted a roadmap to Pratchett-inspired storytelling. Visit settings like the most dubious city in the multiverse, Ankh-Morpork. Intervene in the cultural interactions of trolls and dwarves (but watch out for flying axes). Campaign for goblin rights. Flee from an angry Swamp Dragon (two feet of mindless fury and high-explosive digestion). Even find out why the second-greatest lover on the Disc needs a stepladder. And remember, the world is round. And also flat. The dungeon beckons; dare you answer the call? It's never too soon to prepare for adventures of a lifetime! 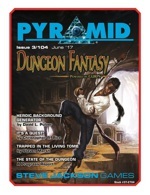 This issue of Pyramid, the PDF magazine for roleplayers, is devoted to the Dungeon Fantasy Roleplaying Game. Learn the basics of the game with "Trapped in the Living Tomb" – a complete, ready-to-play solo adventure. Make a random heroic background with David L. Pulver, or devise a complete campaign framework with a roll of the dice. With this issue, the world of dungeon-delving excitement is closer than ever! 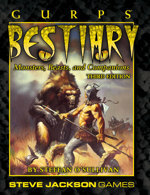 Rule the animal kingdom with GURPS Bestiary in PDF! This edition of the popular supplement includes many of the popular creatures from prior editions, as well as dozens of new beasts. There is an expanded section on using animals as PCs, with templates (and rules for making new ones) and sample animal characters. GURPS Bestiary also includes animal folklore from around the world. This is a digital reprint of a supplement designed for GURPS Third Edition. The Martians descended upon Earth without warning. Saucers filled the skies. Blaster-wielding soldiers, giant insects, and unstoppable robots slaughtered the human defenders on the ground. It could have been the end of humanity – if not for the brave scientists of the Novas Vira, the only ones who saw the invasion coming! Now the fate of Earth hangs in the balance as both sides turn to science, desperately inventing new weapons and defenses in the hope of finding the one that wins the war. Choose your side. Are you among the conquerors here to grant Earth the honor of being added to the Martian Empire? Or are you fighting to save your planet – either on your own or as part of the Novas Vira, Tiger Corps, or United Earth Alliance? Set the scope. Play unprepared civilians stepping up to face Martian raiders, bold saucer pilots defending troops from waves of human jets, high-level officers making decisions that impact the entire war, or anyone else you can imagine! Lock and load. It'll take spirit to win this war, sure, but also technology. Learn about the weapons, defenses, vehicles, and strange inventions of both sides – and take advantage of streamlined rules to make new ones. 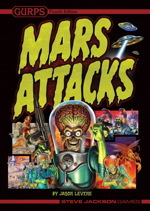 This is a PDF printing of GURPS Mars Attacks, and requires the GURPS Basic Set, Fourth Edition.